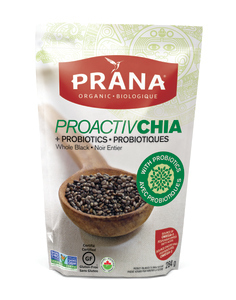 PRANA is a Quebec company that creates healthy organic snacks, nuts and dried fruit, as well as chia seeds. We have repurchased PRANA’s Kilimanjaro organic trail mix quite a few times now from Costco. The snack is a delicious and nutritious blend of dark chocolate chips, dried cranberries, sweet raisins, crunchy almonds, brainpower boosting walnuts, and salty cashews that we (along with our young son) absolutely adore. So when the company reached out to us to sample their new ProactivCHIA, we didn’t hesitate taking them up on their offer. We also love showcasing eco-friendly Canadian food companies! ProactivCHIA is a powerful triple threat superfood (omega-3 + vitamins/minerals + probiotics) with an amazing nutritional profile: A 30g (2tbsp) contains 11g of fiber, 4 g of protein, 9g of good fat in the form of omega-3, plus calcium, manganese, magnesium, phosphorus, zinc, vitamin B3 (Niacin), Potassium, Vitamin B1 (Thiamine) and Vitamin B12. And each serving contains 4 billion CFUs of probiotics from 2 live strains of Lactobacillus acidophilus and Lactobacillus helveticus. 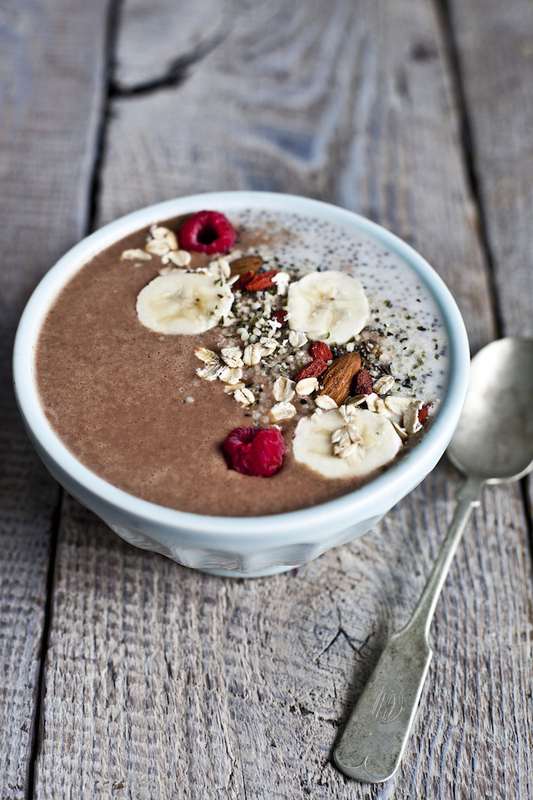 Prepare your chia pudding the evening before, by combining all the ingredients for the pudding, in a mason jar. Shake vigorously. Every 10-15 minutes, shake the jar to make sure the seeds don’t stick to the bottom. In the morning, blend all the smoothie ingredients until smooth. Pour the ProactivCHIA pudding on one side of a bowl, then pour the smoothie mixture on the other side. Garnish with ProactivCHIA, maca powder, Goji berries, almonds and banana slices. Eat with a spoon! You can purchase PRANA products directly from their website. They offer free shipping in Canada. Or use the locator to find a store nearest you.